I need to add more hours to the day. It seems that I only am able to get half of the things on my to do list done everyday and by the end of the week my list seems to just get longer and longer. I thought that as my kids got older things would be easier, I was wrong. Now I have more dishes, laundry and general mess than I ever did when they were younger. Most days I fall onto the couch exhausted at the end of the day and almost fall asleep watching tv. Weekends are almost worse. With my husband home there are even more cups and bowls to wash and another person to clean up after. My family goes through more cereal bowls that I would ever think humanly possible. Weekdays are easier in many ways since my husband and oldest leave for part of the day. However, my youngest seems to make the mess of three people. Since I have been short on time the last couple of months I have been looking for recipes that are easy to put together and cook. 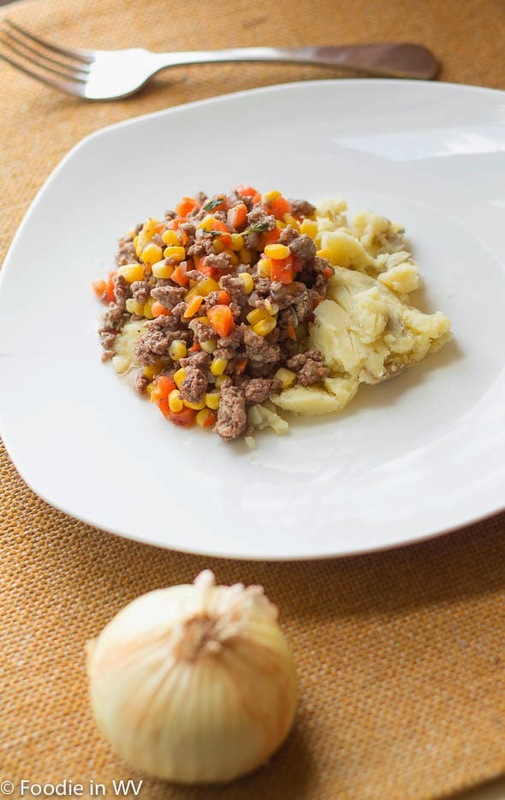 Last week I tried a new recipe for Quick Shepherd's Pie from the March/April issue of Eating Well Magazine. This recipe has 13 ingredients. It takes 35 minutes of total time, all of which is active and makes 4 servings. I only made a few changes to the original recipe. First, I used baby Yukon Gold potatoes. I find the baby potatoes easier to work with in soups and stews since they can just be cut into fourths. There is only one kind of lamb available in our area, so that is what I bought. Since it was higher in fat I drained the lamb after it was browned and added it back into the pan. I prefer the flavor of higher fat meats, but not the grease so the modification enabled the flavor without the greasiness. Finally, I did not thaw my corn. I threw the corn in still frozen and just upped the total cooking time at the end. Honestly, I hate thawing frozen veggies and rarely do it. My family really enjoyed this recipe. It is very easy to prep and put together so it's perfect for a busy weeknight meal. Lamb is one of my favorite proteins. A little amount adds great flavor to dishes, I love it. This recipe is also nice since it has 25 grams of protein, which with two growing boys is always something that I look for. 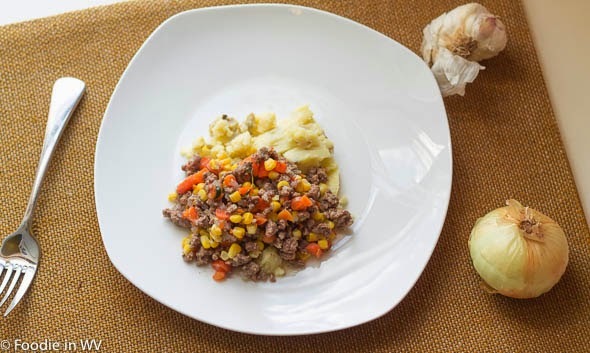 For the recipe go to Quick Shepherd's Pie. 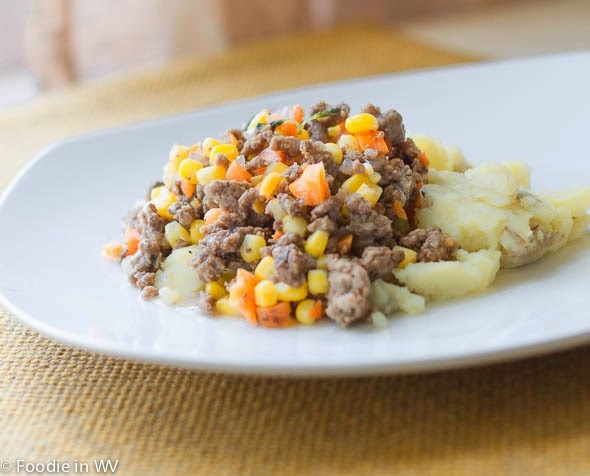 I love shepherds pie and this look delicious! Thanks :) I love it too! I don't think I've ever eaten this but I always think it looks good when I see it in cookbooks or magazines. I wonder how it would be with ground turkey? I often substitute that for beef in recipes. Quick, and delicious...a perfect lunch recipe. It is a great dinner or lunch recipe! My whole family seems to use enough dishes for an entire army. I am not sure how that happens. It looks easy to make, and like it's a happy comfort food. How cute :) My two boys love to cook for me, I think it's adorable! It really is an easy recipe! I had shephetd's pie in England several years ago and loved it. Looks delicious! Thanks :) My husband is a huge fan of shepherd's pie!